The Land Rover BAR Academy today announced the first young sailors to join their programme. Inspired by Ben Ainslie, the Land Rover BAR Academy will find and support talented young British sailors. It's run by Land Rover BAR, the team challenging for the 35th America's Cup, and supported by Land Rover. The goal is to create a pathway into the America's Cup, with the immediate focus of creating a British team that can win the Red Bull Youth America's Cup (RBYAC) in June 2017. The Land Rover BAR Academy's programme for 2016 will see the team sailing the Extreme Sailing Series™, and the team will soon be racing at the next event in Cardiff, 24-26th June. Land Rover BAR Sailing Team Manager, Jono Macbeth and sailing team member, Paul Campbell-James, will be in Cardiff in mentoring roles. The new members of the Land Rover BAR Academy will have access to the team's expertise and facilities, including workshops at the team's home in Portsmouth. The seven sailors chosen come from different areas of high performance sailing sport. William Alloway, Neil Hunter and Sam Batten all have a background in monohull skiffs, Alloway is twice winner of the 29er National Champion and currently sailing the Olympic skiff class, the 49er. Sam Batten has won a couple of RYA Youth Championships in the 29er, and won a silver at the Youth Worlds in 2011; while Neil Hunter was the first U21 crew at the 49er Worlds in 2014. Hunter viewed his fitness as central to his place on the roster. "I think it was my fitness that got me into the Land Rover BAR Academy. It's always been a huge thing for me and obviously with the America's Cup moving towards these high performance catamarans it's become massively important," he explained. High performance multihulls have provided three of the seven, with Owen Bowerman winner of the UK round of the Red Bull Foiling Generation series last year, as well as being an U22 RYA National Match Race champion and 29er Youth Champion in 2014. "I've brought some experience in foiling catamarans to the team, I've sailed a lot of classes and I think that ability to learn about different boats has really helped me to get here," said Bowerman. There are some newcomers to foiling too; Sam Batten is one of those with a background in skiffs. "I can't wait to get out on the GC32s to start with and improve from there. I've never been foiling before, so I'm really looking forward to it," he said. Oli Greber was second at the Red Bull Foiling Generation UK, and also took a bronze medal in the multihull class at the ISAF Youth Worlds. Covering all his options, Greber also applied for an internship with Land Rover BAR, even while he was trialling for the Land Rover BAR Academy. "I knew that the skills that I would learn through the internship would be very relevant to the Land Rover BAR Academy," explained Greber, "so I applied for both and recently heard that I'd got the internship as well as a place in the Land Rover BAR Academy. I'm helping out all the different departments in the Shore Team and I'm picking up lots of different skills within composites, hydraulics, how the foils work and all the intricacies within the boats — it's such a broad range of skills." Adam Kay also realises the important of marine industry experience, with a long CV that includes sailmaking for Nacra, rigger for the Extreme Sailing Series and a long list of high performance multihull events. He has his eyes firmly set on the Youth America's Cup. "It's really good, amazing to be here, and I can't wait to see how things develop with the team and see what we can achieve and even hopefully win the Youth America's Cup." Rob Bunce gets his experience from the world of offshore sailing, having previously competed in the legendary Solitaire du Figaro. He also has extensive experience on the yacht racing circuit. "A lot of these guys have come from one- or two-person boats, and I'm the different guy. I've done a lot of match racing with five man teams so I've certainly got that bit of leadership and the team work skills. This is a fantastic opportunity, I think that anyone our age is supremely lucky to be involved and it's wonderful that such a big team in this country has got youth involved this early on in their formation of an America's Cup team." All of the Land Rover BAR Academy commented on the inspirational impact of being part of this new initiative. "It's an amazing opportunity to train with the Land Rover BAR senior team and be inspired by them, see where we need to get to. We had Bleddyn Mon with us yesterday, pushing us on, and Jonathan Macbeth came in and chatted with us – it's seeing our childhood heroes and trying to get to where they are," reflected William Alloway. 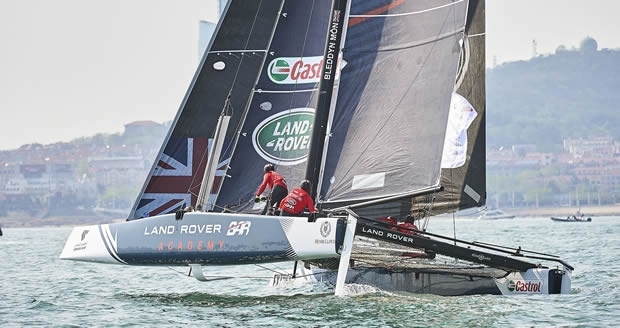 The Land Rover BAR Academy is coached by Andrew Walsh, a former Extreme Sailing Series and Olympic multihull sailor and coach, with Rob Andrews, London 2012 Olympic Sailing/Venue Manager, and a former RYA Olympic coach, acting Team Manager.